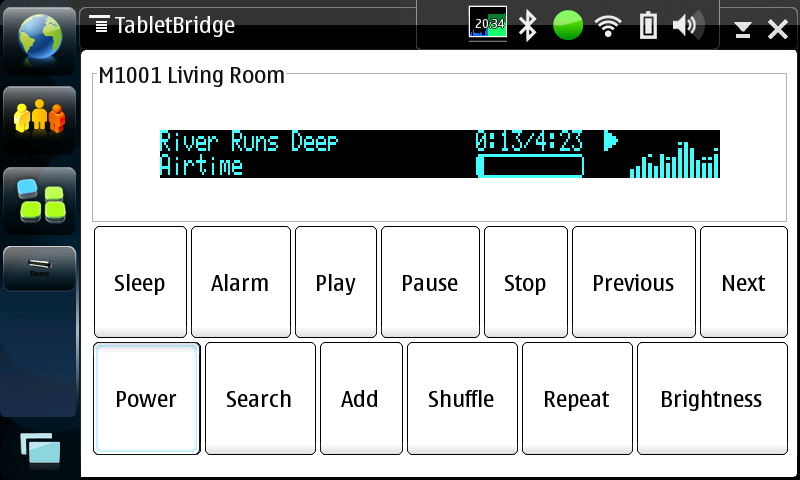 Control and view your Roku Soundbridge M1000, M2000/Soundbridge Radio R1000 via Wifi with your Nokia 770/N800/N810/N900 (OS2006/OS2007/OS2008/Maemo 5) Internet Tablet. Also remotely control your Roku Soundbridge M500. Under the application menu, there are two commands and four Soundbridge entries. The four Soundbridge entries will be the last four accessed devices. In the event that an entry is unable to connect to a Soundbridge, you will be prompted to remove the entry. The New command allows you to enter your Soundbridge name and IP address manually. 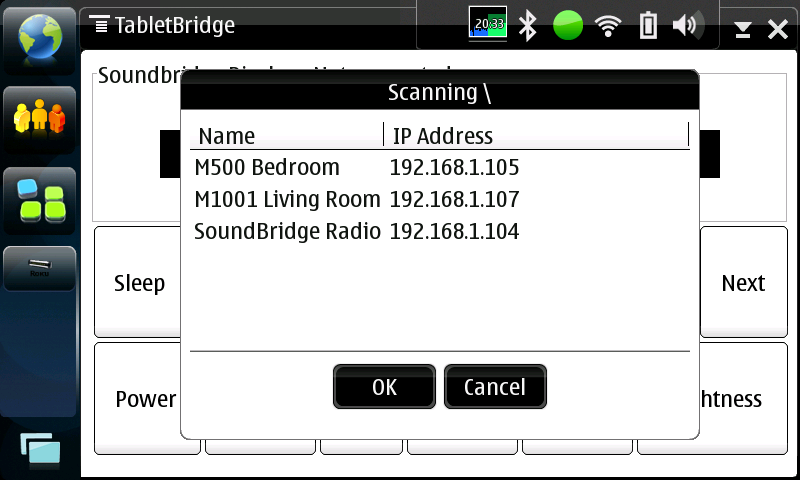 The Scan command will find Soundbridge devices on the same subnet. Soundbridge detection can take up to 40 seconds. The device keys are mapped to remote commands. The remaining remote keys are mapped to buttons on the screen. Some things that I would like to implement. Scanning had a race condition that could result in only 1 Soundbridge being detected. Fixed and optimized scanning. Updated to work with diablo autobuilder. Soundbridge Radio detection was not working reliably - fixed. Add R1000 (Soundbridge Radio) compatibility - added by Ant Daniel (antdaniel@gmail.com). Added scan code to detect Soundbridge devices on the same subnet. Detection can take up to 40 seconds. Fixed a bug that prevented the 4th recent entry from being deleted after a failed connection. After being connected to one Soundbridge, failed connections resulted in repeating periodic_update messages - fixed. Clear the display on new connections so that failed connections don't leave old data on the screen. Reverse order of Previous and Next buttons. Handle waiting for network and losing network. This is my first time I have used GTK or sockets. Suggestions are gladly taken, email me at frank.banul@gmail.com. This program is dedicated to my Grandfather, Anthony Pinkus. If you would like to support the development of this application, you are welcome to make a donation of any amount via PayPal.